History The Butterfly was born in late 1961, in Libertyville, Illinois, the idea of John Barnett. John was a non-sailor, but he lived in the lake region of northern Illinois and was surrounded by sailing friends, and he knew a more than little about fiberglass boat construction. His idea for a small fun boat for the lakes was a reduced-size copy of the Inland Lake Yachting Association's C Scow, a 20-foot scow-hulled boat with a single sail. He shrunk the hull dimensions to 12 feet overall, and simplified the boat with a single centerboard and rudder instead of the C's double lee boards and rudders. With the considerable help of a number of people, especially family friend and first National Champion Dr. Robert Chamberlain, first NBA Commodore Mike Daskilakis, and the second Butterfly National Champion Jim Miller, he got the boat and the class going in 1962. While John focused on production, Jim helped set up a dealer network, and Mike looked after the organization of the new class association. Key early elements in the boat's success were getting Dale Frank, of Sailplace, in Cedar Springs, MI, as one of the first dealers, and getting the first Nationals successfully run at Grand Rapids, MI, in 1962. These two happenings cemented the Butterfly 's place in Michigan sailing, where it became the official training boat of the Western Michigan Yachting Association. The late '60s and the '70s were the golden years for all of small boat sailing, and the Butterfly was a big part of the boom, with Barnett struggling to keep up with annual growth while keeping quality high, and the class seeing regatta participation leaping up, peaking with the huge 144-boat fleet at the 1972 Nationals in White Lake, MI. The Single Handed Nationals peaked with 81 boats in 1979. The boat was originally raced as a "family" boat, with a 2-person, 250 lb minimum, but with growing regatta participation, and increased competition, there was seen a need for a more serious single-handed event, which debuted as the Single-Handed Nationals in 1970 at Lake Lanier in Georgia. The original concept had the Single Handed event as a midwinter or spring event in the south of the US. Key people in the single-handed evolution were Jim Young from Wisconsin, and Ray Burke from Georgia. The '80's were years of changes for all of small-boat sailing, as the boom years ended and the smaller classes and less well-built boats faded from the scene. The Butterfly survived, but with some changes. John Barnett felt that his 20 years of boat production was enough, and he sold the business, Barnett Boat Company, to Hedlund Marine, of Wilmette, Illinois. Hedlunds moved production to a new factory in Green Lake, Wisconsin, where it remained until Hedlunds sold production of the boats to Windward Boatworks, about 10 miles west of the previous factory in central Wisconsin, in 2007. 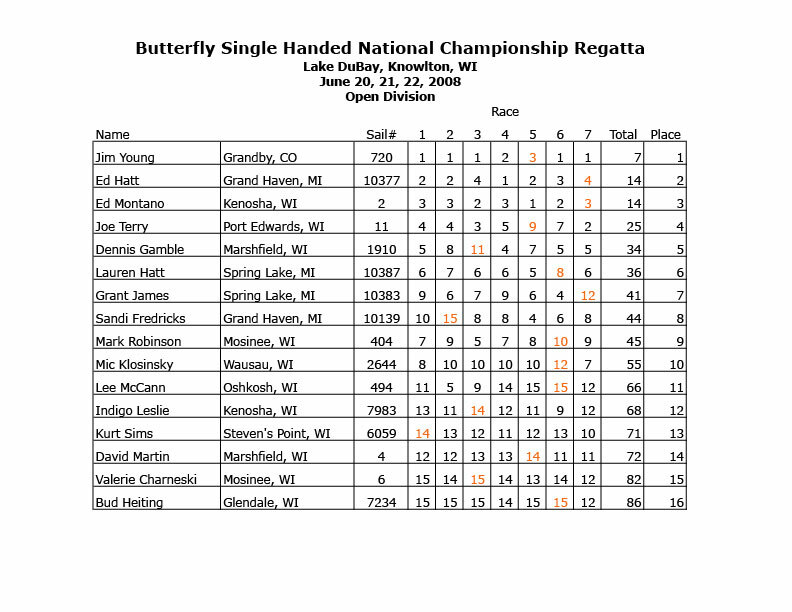 The class instituted some small changes, all in the effort to keep regatta numbers up, the biggest of which was eliminating the 2-person/250 lb rule, and renaming the Nationals the Open Nationals, where the boat could be sailed with or without a crew, to distinguish it from the Single-Handed Nationals. The Singles also went through a small change, doing away with its southern history and opening the event to any site in the US. By moving the event more into the north and the home Butterfly country in the midwest, it was hoped to help keep interest and attendence up. The class, like all small sailboats, struggled in the early '90s to stay alive, while Hedlunds fought to keep reasonable sales numbers going. Thanks to the boat's stable base in Michigan, the class survived and both sales numbers and regatta attendance climbed in the first decade of the new century, making the Butterfly one of the very rare small boats to make it through the decade. Its now nearing the end of the Butterfly 's 5th decade of production and racing, and the class shows clear signs that it will be one of the survivors well into the next century. Key elemnts in the success of the class; the continued high quality of the boat construction pioneered by John Barnett, and the continued enthusiasm and active participation in the class of veterans of sailing's boom days, as well as the new families that keep discovering the boat and adding their energy to its life.